Summary. The article is enlightened by the peculiarities of the corporate governance development in Ukraine in modern realities. The corporate sector is one of the most important components of the Ukrainian economy. Issues of effective corporate governance have recently become one of the most important topics in Ukraine. Corporations want to ensure the transparency of their activities. 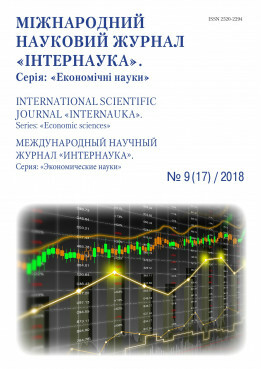 The share of subjects for organizational and legal forms of management in Ukraine for 2008-2018 are analyzed on the basis of actual material; the reasons of –decline in the number of joint-stock companies; problems of joint-stock ownership form management subjects’ functioning. Analysis shows that the share of JSC and LLC has changed significantly. A rather small share belongs to the corporation and the additional liability company. Choosing one of business organization forms enterprises face with the most important problem such as providing real protection of the rights and legitimate interests of all participants of enterprises, and especially stockholders as its co-owners. It can be solved through the effective corporate governance which has a legislative basis. The adoption of laws on corporate governance is an important achievement in this area , they reflect the modern point of view on the problem studied in 2017, «On Amending Certain Legislative Acts of Ukraine on Corporate Treaties», «On Amendments to Certain Legislative Acts of Ukraine on Increasing the level of corporate governance in joint-stock companies», and in 2018, «On Amending Certain Legislative Acts of Ukraine on Facilitation of Business and Investment Attraction by Securities Issuers». The article reveals the problems of the modern reform of joint stock companies. The ways of use and development of corporate legislation in Ukraine at the present stage are presented. Key words: corporate governance, joint-stock company, modern corporate law. Аннотация. Статья посвящена особенностям развития корпоративного управления в Украине в современных реалиях. Корпоративный сектор бизнеса является одной из главных составляющих частей экономики Украины. Вопросы эффективного корпоративного управления за последнее время стали одной из наиболее важных тем в Украине. Корпорации стремятся обеспечить прозрачность своей деятельности. На основе фактического материала проанализирован удельный вес субъектов по организационно-правовым формам хозяйствования в Украине за 2008-2018 года; причины, которые обусловили тенденцию снижения количества акционерных обществ; проблемы функционирования субъектов хозяйствования акционерной формы собственности. Анализ свидетельствует, что значительно изменился удельный вес АО и ООО. Достаточно незначительный удельный вес приходится на корпорации и общества с дополнительной ответственностью. Выбирая ту или иную форму организации бизнеса, предприятия сталкиваются с главной проблемой – обеспечение реальной защиты прав и законных интересов всех участников предприятий, и особенно акционеров как его совладельцев. Решить её можно путем эффективного корпоративного управления, которое имеет законодательную основу. Важным достижением в этой сфере является принятие законов про корпоративное управление, которые отображают современную точку зрения на исследуемую проблему: в 2017 г. «Про внесения изменений в некоторые законодательные акты Украины по корпоративным договорам», «Про внесения изменений в некоторые законодательные акты Украины по повышения уровня корпоративного управления в акционерных обществах», и в 2018 г. «Про внесения изменений в некоторые законодательные акты Украины по упрощению ведения бизнеса и привлечения инвестиций эмитентами ценных бумаг». В статье выявлены проблемы современной реформы акционерных обществ. Представлены пути использования и развития корпоративного законодательства в Украине на современному этапе. Ключевые слова: корпоративное управление, акционерное общество, корпоративное законодательство. Statement of the problem. The corporate sector is one of the most important components of the Ukrainian economy, it’s results significantly influence the development of strategic market relations in the country, determine the possibility of attracting investments necessary to improve the structure of production and the economy as a whole. The object of corporate governance is activity of those enterprises, which initial (statutory, registered) capital is divided into certain shares. According to the Commercial Code of Ukraine , this definition includes such enterprises as corporations, public and private Joint-stock companies, limited liability company, as well as additional liability company. Issues of effective corporate governance have recently become one of the most important topics in Ukraine and the subject of discussion at conferences and seminars. The largest corporations, which some years ago were the main violators of the shareholders’ rights, are focusing their efforts on the introduction of effective corporate governance today. To this end, they adopt codes of corporate governance, introduce independent directors into the board of directors. In that way corporations want to ensure the transparency of their activities. In Ukraine, by the decision of the National Commission on Securities and Stock Market of Ukraine, the Principles of Corporate Governance  were approved in December 2003, the Law «On Joint-stock Companies»  came into force in 2008, an important achievement in this sphere is the adoption of laws in 2017 «On Amending Certain Legislative Acts of Ukraine regarding Corporate Treaties» , «On Amendments to Certain Legislative Acts of Ukraine on Increasing the Level of Corporate Governance in Joint-stock Companies» , and «On making changes to some law Davca Acts of Ukraine on simplification of business and investment attraction Issuers»  in 2018. Despite the government's actions, many Joint-stock companies are involved in various corporate conflicts, which worsen the financial and investment situation of enterprises. This reduces the investment attractiveness of societies in the eyes of potential investors, as a result, it negatively affects on the overall investment and economic conditions of the country. Analysis of recent research and publications. The development of scientific achievements shows that the problems of the emergence and development of corporate governance attracted the attention of many researchers. Problems of the shareholders’ rights violation are treated in the writings of foreign scholars: A. Berl, J. Mens, S. Grossman, D. Hamilton, J. Dunning, D. Cricton-Miller, P. Warman, M. Gibson, D. Wiley, G. Minaza, R. Coase, C. Mayer, M. Jensmen, W. Meckling, R. Morck, A. Shleifer. His works were devoted to these problems by such domestic scientists as: G. Alekseev, A. Bobrishev, E. Gubin, E. Danilov, A. Danelian, E. Bokhanov, A. Kotov, S. Kravchenko, M. Kuzheliev, V. Laptev, S. Mogilevsky, O. Osipenko, R. Poser, I. Ryedkin, A. Stikhin, O. Williamson and others. In spite of this, the issue of identifying features of corporate governance models in contemporary environment are unresolved. Formulation purposes of article (problem). It is supposed to consider the features of corporate governance in Ukraine and recommendations, taking into account the latest legislation. The main material. The modern notion of «Joint-stock company» is defined at the legislative level in the Civil and Commercial Codes of Ukraine and the Law «On Joint-stock Companies». According to Part 1 of Art. 152 of the Civil Code of Ukraine, a Joint-stock company is a business association whose authorized capital is divided into a certain number of shares of the same par value, corporate rights which are certified by shares . Also, the definition of the concept of a Joint-stock company is contained in Part 1 of Art. 3 of the Law of Ukraine «On Joint-stock Companies». As to the Commercial Code of Ukraine, in Part 2 of Art. 80 provides another, more detailed definition: a Joint-stock company is an economic partnership with a share capital divided by a certain number of shares of the same nominal value, it is responsible only for the property of the company for the obligations, and the shareholders bear the risk of losses associated with activity of the society, within the value of their shares . The issues of legal regulation of Joint-stock companies are also defined in the laws of Ukraine «On Business Associations» , «On Securities and the Stock Market» , «On the National Depository System of Ukraine». According to the current legislation, there are two types of Joint-stock companies: public and private. Nevertheless, studies, which are carried out in this area, make it possible to state, that in practice not all Joint-stock companies have changed the name from open to public and from closed to private, although it is determined at the legislative level. On the basis of the statistical analysis conducted, it is possible to determine that Joint-stock companies in Ukraine include public Joint-stock companies (hereinafter – PJSC), private Joint-stock companies (hereinafter –PrJSC) and companies, which change the ownership form. From 2008 to 2018, the total number of JSCs are decreased by 17 335 units, from 31 993 to 14 658 enterprises . Other enterprises of the corporate type have increased their number. Thus, the largest change in the number has recorded in limited liability companies for 10 years: an increase of 297 702 enterprises. The companies with additional liability became more on 870, and corporations – on 169 enterprises. The share of entities of the USREOU (The Unified State Register of Enterprises and Organizations of Ukraine) in terms of organizational and legal forms of management is presented in Table 1. It is calculated that the share of JSC and LLC has changed considerably. A rather small share belongs to the corporation and the company with additional responsibility. Obviously, the most popular organizational form is the limited liability company. Choosing one of the business organization enterprises face with the most important problem – providing real protection of the rights and legitimate interests of all participants of enterprises, and especially stockholders as its co-owners, when it comes to Joint-stock company. It is possible to solve it through the effective corporate governance, which is the basis for improving the quality of management decisions, obtaining a positive financial result and improving the financial and economic indicators in general. In line with the foregoing, these reasons should be investigated in more detail. Reorganization of JSC in other organizational and legal forms: most often it is a reorganization into limited liability companies, which is confirmed by statistics. The total number of limited liability companies (hereinafter referred to as LLC) increased by 6 372 units for the period of 2013-2015. This transition is explained by the advantages of LLC over the JSC, which can include the minimum amount of authorized capital: JSC – 1 250 minimum wages established on January 1of the reporting year (on January 1, 2017 – 4 million UAH), while the size of the authorized capital of LLC are not limited. Typically, LLC focuses on small business entities, whereas Joint-stock companies are a legal form of association of large capital. In Ukraine, as of 2015, small and medium-sized businesses account for 99,88 % (343 017 enterprises) of the total number of enterprises, where the size of the authorized capital does not always reach the required number for the establishment of JSC and the advantage is given to the establishment of activity in the form of LLC . Since the size of the authorized capital of a JSC depends on the minimum wage, which is approved in the state for the relevant year, the analysis of its size indicates a significant increase from UAH 1 433 750 in 2013 up to 4 million UAH in 2017, or 120,7 % in relation to 2016, which is also one of the reasons for reducing the number of blood pressure. large primary expenses of money and time at registration at the expense of charges for legal services, preparation of registration documents, issue of shares, etc. capabilities for officials’ abuse; the instability of the legislative framework [14, p. 112-123]. if JSCs do not meet the requirements, hold an additional issue of shares or sell part of the shares in free circulation . In order not to violate the requirements of the legislation, the majority of the PJC is reorganized from the PJSC into the PrJSC or, according to the changes in the legislation, issues 10 % of the shares in free circulation. As the issue of shares may lead to a reduction in the size of the state package and, consequently, to the loss of the blocking package, the supervisory boards put to the general meeting of shareholders the issue of reorganization of the companies that will be held during 2017, therefore, changes in the legislation are aimed primarily at protecting minority shareholders. The top list of Doing Business ranked Ukraine as an indicator of «protection of minority investors» in 2017 at the 70 th position, 2016 – 101 st position . Ukraine has improved its position by 31 points, indicating an effective state policy in this area. The state has completed the preparation of the Joint-stock companies reforms. In 2017, the Law of Ukraine «On Amending Certain Legislative Acts of Ukraine on Increasing the Level of Corporate Governance in Joint-stock Companies»  entered into force, which changes the principles of corporate governance. The relevant legislative act supplements the Law of Ukraine «On Joint-stock Companies» with new articles 651 «Acquisition of shares of a public Joint-stock company after the effects of acquiring a controlling interest or a significant controlling interest in shares», 652 «Mandatory sale of ordinary shares by shareholders at the request of a person jointly), which owns 95% and more of ordinary shares», 653 «Obligatory acquisition by a person (persons acting jointly), which owns 95% and more of the shares of the Joint-stock company at the request of stockholders», 654 «Consequences of failure to comply with the obligations of the owner of a controlling interest or a significant controlling block of shares or a block of shares in the amount of 95 and more percent of the company's shares», and 655 «Features of acquiring control and dominant controlling stakes in private equity companies» etc. The law introduces institutes such as squeeze-out and sell-out. Sell-out will allow minority shareholders to require a shareholder-owner to buy 95 % of the company's shares at the fair value of the shares they own. With this mechanism, minority shareholders will be able to avoid losses from the possession of small securities. In turn, the squeeze-out institution assumes that the shareholder-owner of 95 % of the shares (control package) of the company will have the right to demand from minority shareholders the mandatory sale of their. The National Securities and Stock Market Commission shall be empowered to monitor the compliance of market participants with the requirements of special procedures and the right to apply measures of influence to participants, who fail to comply with the specified requirements. In addition, it provides for mandatory disclosure of information on the change of shareholder who owns 5 and more percent of ordinary shares of a public Joint-stock company on the acquisition by a person of a block of shares in the amount of 50 percent or more, or 75 percent or more, or 95 percent or more of the shares of the company, as well as information about such stockholders. The law also provides for the addition of new Civil Code of Ukraine articles on the establishment of a mechanism for the conditional storage account, which will provide an opportunity to improve payments for purchased shares. The conclusion of corporate agreements with the participation of the state is regulated by a separate law «On Amending Certain Legislative Acts of Ukraine regarding Corporate Treaties» , which entered into force in 2018. The law amended the Civil Code. It is envisaged that in case of violation by the debtor of a negative obligation, the creditor, regardless of the payment of a penalty and (or) indemnification and non-pecuniary damage, has the right to demand termination of action, from which the debtor undertakes to abstain, if this does not contradict the content of the obligation. Such a claim may be brought by a creditor and in case of a real threat of violation of such obligation. In addition, the Code was supplemented by a new Article 658-1, which governs the acquisition of the right to unilaterally terminate the contract. The provisions on corporate agreements are included in the Laws «On Joint-stock Companies» and «On Business Associations». Also resolved the issue of irrevocable power of attorney on corporate rights. At the same time, a separate law regulates the procedure and conditions for the conclusion of corporate agreements, in which one of the parties is the state, an economic society, in which part of the state is 100 % or legal persons, in which the state or such associations of people directly or indirectly owns 25 and more percent of the authorized capital. In 2017, the Verkhovna Rada Committee on Financial Policy and Banking Activities has already recommended to approve the bill «On Simplification of Business and Investment Attraction by Securities Issuers». This document will allow Ukraine to fulfill its obligations to the EU, enshrined in the Association Agreement, as part of the rules on the issue of securities and the disclosure of information by issuers. In the European Union, the key criterion for the division of private and public companies is the presence or absence of a securities public offer. At the same time, the number of shareholders is still the key criterion in Ukraine. The National Securities and Stock Market Commission (NCSMC) found in Ukraine 14 831 Joint-stock companies, of which only 7 500 changed the form of ownership to public (2 554) or private (4 946) Joint-stock companies. The remaining open and closed Joint-stock companies (7 331) must be re-registered by January 1, 2018 . This is not the only problem. In April 2015, the parliament strengthened its requirements to the PJSC: all public companies should go through the procedure for entering their shares into the stock exchange of any exchange, form a supervisory board of at least five people, two of which are independent directors. However, companies offered an alternative - the possibility of re-registration into the PrJSC, even if there were more than 100 shareholders. Deadline for these changes will also be January 1, 2018. As a result, on October 2, 2017, there were only six issuers in the exchange registers (Donbassenergo, Motor Sich, Ukrnafta, MHP, Pivdennyi Bank, Industrialbank), and on the stock exchanges there were 381 issuers. The problem of companies is that they have received «publicity» as a result of privatization, rather than a conscious desire to be transparent. Therefore, many PSJCs do not want to comply with the requirements for listing in the stock register, the minimum share of free circulation and the minimum number of shareholders. From January 1, 2018, any public JSC, whose shares will not be included in the stock register, and which has not made a public offer of shares, will automatically become a legal regime for the activities of private JSCs. To bring the statute in compliance according to the new status will be possible for two years or earlier, for example, in the course of the next change in the authorized capital or when obtaining new licenses in state bodies. Public JSCs, whose shares are included in the stock exchange register or who make a declaration that they have made a public offer will fulfill more stringent requirements. The key differences between PSJC and PrSJC will be several. Only PSJC will be able to hold an IPO, while the shares of both groups of companies will be able to bargain on the stock exchange. But if the shares of PrSJC will be only on the stock exchange list, then PSJC - either in the registry or in the list. If the PrSJC has up to 100 shareholders, it will be able to prescribe in the charter a preferential right of shareholders to purchase shares that are sold. But if the minority shareholders are more than one hundred, they can freely trade in shares. Public JSCs will have to create a supervisory board of at least five people, three of which should be independent directors. They will lead three committees under the supervisory board: from auditing, rewards and appointments. Issues relating to the competence of the supervisory board will not be resolved by the general meeting of shareholders. Supervisory boards may also appear in private Joint-stock companies if more than ten unskilled investors are present in the joint-stock. Another consequence of publicity is the disclosure of information. Disclosure of annual and quarterly reports, as well as special information on significant events in the company will be mandatory for PJSC. Private JSCs will only submit annual reports and special information (to a lesser extent than PSJCs). As a result of the reform, publicity requirements should not be burdensome for Joint-stock companies, which, in fact, have never been public. At the same time, real public JSCs that identify themselves as public or want to hold an IPO will be required to meet higher standards of corporate governance. to Joint-stock companies, which are considered not to have made a public offer of shares, the requirements of the Law of Ukraine «On Joint-stock Companies» shall be applied in relation to the regulation of activities of private Joint-stock companies. the charter of such a partnership is set out and the supervisory board of such a company consists of not less than one third of the independent directors, with the number of independent directors being at least two persons. for the remaining Joint-stock companies - by January 1, 2020.
changes made by this Law to the Law of Ukraine «On State Registration of Legal Entities, Natural Persons - Entrepreneurs and Public Associations»  regarding information that should be additionally disclosed in the Unified State Register of Legal Entities, Individuals - Entrepreneurs and Public Associations, are applicable to the information that will arise after the day this Law enters into force. Insights from this study and perspectives for further research in this direction. Consequently, in the context of the processes taking place in the world now and the full member of which is Ukraine, the search for a perfect corporate governance system remains one of the priority tasks at the level of individual states and at the interstate level. The impellents of modern corporate law reform, which covered virtually all countries, are objectively internationalization and competition, the change in the number of shareholders and their structure, the development of financial markets and new technologies. A significant number of national and international corporate governance codes reflect this trend and are increasingly affecting traditional legislation. Commercial Code of Ukraine dated January 16, 2003 No. 436-IV [Electronic resource]. – Access mode: http://zakon4.rada.gov.ua/laws/show/436-15. Civil Code of Ukraine dated January 16, 2003 No. 435-IV [Electronic resource]. – Mode of access: http://zakon2.rada.gov.ua/laws/ show / 435-15. On Approval of Principles of Corporate Governance dated December 11, 2003 No. 571 [Electronic resource]. – Access mode: https://www.bank.gov.ua/doccatalog/document?id=36988. On Joint-stock Companies: Law of Ukraine dated September 17, 2008 No. 514-VI [Electronic resource]. – Mode of access: http://zakon4.rada.gov.ua/laws/ show / 514-17. On Amendments to Certain Legislative Acts of Ukraine regarding Corporate Treaties: Law of Ukraine dated January 17, 2017 No. 1984-VIII [Electronic resource]. – Access mode: zakon.rada.gov.ua/laws/show/1984-19. On Amendments to Certain Legislative Acts of Ukraine on Increasing the Level of Corporate Governance in Joint-stock Companies: Law of Ukraine dated March 23, 2017 No. 1983-VIII [Electronic resource]. – Access mode: zakon.rada.gov.ua/go/1983-19. On Amending Certain Legislative Acts of Ukraine Concerning Simplification of Business and Investment Attraction by Securities Issuers: Law of Ukraine dated November 16, 2017 No. 2210-VIII [Electronic Resource]. – Access mode: zakon.rada.gov.ua/go/2210-19. On Business Associations: Law of Ukraine of 19.09.1991 No. 1576-XII [Electronic resource] – Access mode: http://zakon4.rada.gov.ua/laws/show/1576-12. On Securities and the Stock Market: Law of Ukraine dated February 23, 2006 No. 3480-IV [Electronic resource]. – Access mode: http://zakon.rada.gov.ua/cgi-bin/laws/main.cgi. On the Depository System of Ukraine: Law of Ukraine dated 06.07.2012 № 5178-VI [Electronic resource]. – Access mode: http://zakon2.rada.gov.ua/laws/show/5178-17. On State Registration of Legal Entities, Individual Entrepreneurs and Public Formations: Law of Ukraine dated May 15, 2003 No. 755-IV [Electronic resource]. – Access mode: zakon.rada.gov.ua/go/755-15. Number of legal entities by organizational form on January 1 ... [Electronic resource]. – Access mode: www.ukrstat.gov.ua/edrpoy/ukr/.../ks.../ks_opfg_0118.htm . Official site of the State Statistics Service of Ukraine [Electronic resource]. – Access mode: www. ukrstat.gov.ua. Stern G. Yu. Corporate Management: teach. manual / G. Yu. Stern. – Kharkiv: KSAME, 2009. – 278 p.
National Securities and Stock Market Commission [Electronic resource]. – Access mode: http: // nssmc. gov.ua. Economic Ranking - Doing Business - The World Bank [Electronic Resource]. – Access mode: russian.doingbusiness.org/rankings. Ghospodarsjkyj kodeks Ukrayiny vid 16.01.2003 r. № 436-IV [Elektronnyy resurs]. – Rezhym dostupu: http://zakon4.rada.gov. ua/laws/show/436-15. Cyviljnyj kodeks Ukrajiny vid 16.01.2003 r. № 435-IV [Elektronnyy resurs]. – Rezhym dostupu: http://zakon2.rada.gov.ua/laws/ show/435-15. Pro zatverdzhennja Pryncypiv korporatyvnogho upravlinnja vid 11.12.2003 r. № 571 [Elektronnyy resurs]. – Rezhym dostupu: Режим доступу : https://www.bank.gov.ua/doccatalog/document?id=36988. Pro akcionerni tovarystva : Zakon Ukrajiny vid 17.09.2008 r. № 514-VI [Elektronnyy resurs]. – Rezhym dostupu: http://zakon4.rada.gov.ua/laws/ show/514-17. Pro vnesennja zmin do dejakykh zakonodavchykh aktiv Ukrajiny shhodo korporatyvnykh doghovoriv : Zakon Ukrajiny vid 17.02.2017 r. № 1984-VIII [Elektronnyy resurs]. – Rezhym dostupu: zakon.rada.gov.ua/laws/show/1984-19. Pro vnesennja zmin do dejakykh zakonodavchykh aktiv Ukrajiny shhodo pidvyshhennja rivnja korporatyvnogho upravlinnja v akcionernykh tovarystvakh : Zakon Ukrajiny vid 23.03.2017 r. № 1983-VIII [Elektronnyy resurs]. – Rezhym dostupu: zakon.rada.gov.ua/go/1983-19. Pro vnesennja zmin do dejakykh zakonodavchykh aktiv Ukrajiny shhodo sproshhennja vedennja biznesu ta zaluchennja investycij emitentamy cinnykh paperiv : Zakon Ukrajiny vid 16.11.2017 r. № 2210-VIII [Elektronnyy resurs]. – Rezhym dostupu: zakon.rada.gov.ua/go/2210-19. Pro ghospodarsjki tovarystva : Zakon Ukrajiny vid 19.09.1991 r. № 1576-XII [Elektronnіy resurs]. – Rezhym dostupu: http://zakon4.rada.gov.ua/laws/show/1576-12. Pro cinni papery ta fondovyj rynok : Zakon Ukrajiny vid 23.02.2006 r. № 3480-ІV [Elektronnyy resurs]. – Rezhym dostupu: http://zakon.rada.gov.ua/cgi-bin/laws/main.cgi. Pro depozytarnu systemu Ukrajiny : Zakon Ukrajiny vid 06.07.2012 r. № 5178-VI [Elektronnyy resurs]. – Rezhym dostupu: http://zakon2.rada.gov.ua/laws/show/5178-17. Pro derzhavnu rejestraciju jurydychnykh osib, fizychnykh osib-pidpryjemciv ta ghromadsjkykh formuvanj : Zakon Ukrajiny vid 15.05.2003 r. №755-IV [Elektronnyy resurs]. – Rezhym dostupu: zakon.rada.gov.ua/go/755-15. Kiljkistj jurydychnykh osib za orghanizacijnymy formamy na 1 sichnja .... [Elektronnyy resurs]. – Rezhym dostupu: www.ukrstat.gov.ua/edrpoy/ukr/.../ks.../ks_opfg_0118.htm. Oficijnyj sajt Derzhavnoji sluzhby statystyky Ukrajiny [Elektronnyy resurs]. – Rezhym dostupu: www. ukrstat.gov.ua. Shtern Gh. Ju. Korporatyvne upravlinnja: navch. posibnyk / Gh. Ju. Shtern. – Kharkiv : KhNAMGh, 2009. – 278 s.
Nacionaljna komisija z cinnykh paperiv ta fondovogho rynku [Elektronnіy resurs]. – Rezhym dostupu: http://nssmc. gov.ua. Reyting ekonomik – Doing Business – Vsemirnyy Bank [Elektronnyy resurs]. – Rezhym dostupu: russian.doingbusiness.org/rankings.